The following article was written by Dean and published in the November 4, 2011 issue of Sports Collectors Digest. 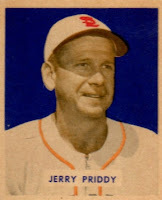 In comparison to their 1948 set, the 1949 Bowman baseball card set was an improvement in both picture quality and quantity. The 1949 Bowman cards are the same size as their predecessor, but, instead of a bland black and white coloring, Bowman tinted the photographs of the players and added a colored the background. Bowman also drastically increased the size of the 1949 set, reaching 240 cards. This set also includes a high number series of cards (#145-240) that were issued in fewer numbers and are harder for collectors to find. The 1949 Bowman set increased to 240 cards, therefore “rookie cards” account for nearly three-quarters of this set. For the first time, African-Americans appeared in a major issue of cards. 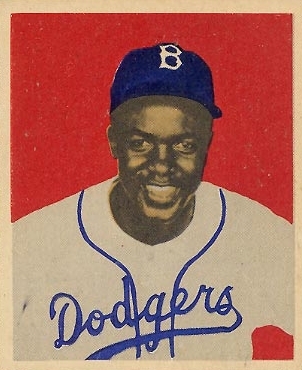 The most prominent rookie cards in the 1949 Bowman set include are Jackie Robinson, Roy Campanella, Satchel Paige and Duke Snider. The 1949 Bowman set also has several different variations for many of the cards. The variations for this set include things like: “name on the front”, “no name on the front”, “print name on back”, and “script name on back”. The 1949 Bowman cards were issued with both white and grey backs. Both backs were issued in roughly the same numbers and therefore have approximately the same value. The 1949 Bowman baseball card set was issued in seven series, consisting of 36 cards each. This was extremely efficient because each of the printing sheets contained 36 cards. The result is a very clean set with an equal population for each of the cards. Has anyone seen card #4? Not only was Bowman getting better at producing cards, they were also getting better at selling their cards. In 1949, Bowman tried a clever “marketing trick” to help increase sales for the 1949 set. 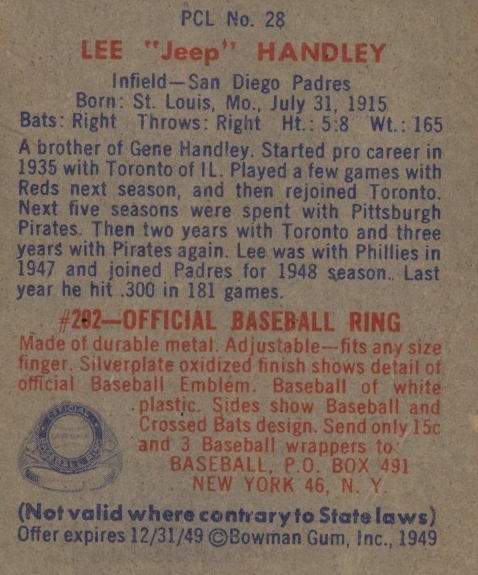 Bowman intentionally “removed” card # 4 from of the 1st series printing sheet, by simply renumbering it as card #73. This marketing ploy was designed to trick boys to waste some of their hard-earned change on first series packs of cards in the hopeless effort to obtain that elusive 1949 Bowman # 4 card. Collectors eventually discovered that they had to wait until the 3rd Series, which was released several months later, if they wanted to obtain card #4. To the disappointment of many young collectors, Bowman had not been saving a superstar for card # 4, instead choosing to feature Jerry Priddy, a St. Louis Browns infielder with a less than remarkable playing career. Another benefit of this deception was that by including a card #73 in the 1st series, it was a clear signal to the kids that the set was going to contain more than 36 cards. My guess is the ruse involving the #4 was treated with some distain by collectors, if it was even noticed by collectors. It is doubtful that this trick increased Bowman’s 1949 card sales by a large amount. As a business owner, I would imagine that the trust lost after pulling a trick like on their customers, far outweighed any extra profit made by increased sales. Either way, this ploy would never be intentionally repeated by Bowman (or Topps) again. 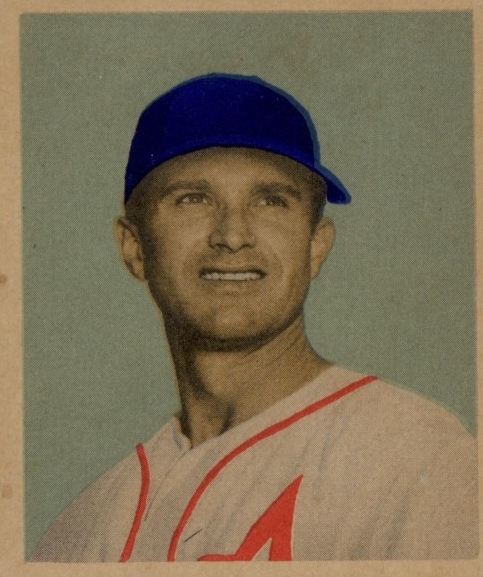 Bowman also tried to tap into the rapidly growing population on the west coast by releasing a 36-card Pacific Coast League baseball card set in 1949 that looked identical to the regular 1949 issue. These cards were distributed only on the west coast and in Bowman’s hometown of Philadelphia. The Pacific Coast League players were particularly popular in the 1940's and early part of the 1950's because there was no major league team playing there until 1957. The Pacific Coast League cards can be easily distinguished by the "PCL" before the card number. 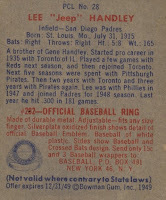 Unfortunately, the PCL cards were not very well received and idea was discontinued after one series of cards; therefore, because they were issued in much smaller numbers, the 1949 Bowman PCL cards are much more expensive and difficult for today’s collectors to find than compared to the regular 1949 Bowman set. Dean Hanley is an authority on vintage sports cards and has written numerous articles on the topic. Mr. Hanley is the founder DeansCards.com, and with well-over one million vintage cards in inventory, DeansCards.com is the largest seller of vintage cards on the web. Dean has also published “Before there was Bubble Gum: Our Favorite Pre-World War I Baseball Cards”, which is available in eBook form at Amazon.com. The 1949 Bowman Article is dedicated to Rocky, a regular SCD reader, who was kind enough to sell us is 1949 Bowman complete set. 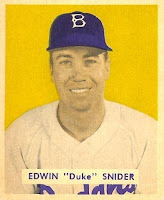 Earlier in the year he also parted with his beloved 1950 Bowman set. Rocky, Please enjoy!